More and more new and seasoned parents are using baby carriers as a convenient and safe way to keep their babies close. There’s even an international organization that recommends babywearing to bond with newborns and carry your child while keeping your hands free. There are several styles of carriers to choose from, all with their own benefits and drawbacks. Soft-sided carriers have a structured seat for baby and shoulder and waist straps that buckle around the wearer. Wraps bind tightly around the wearer’s shoulders and chest to create a cozy hold for baby. Slings rest diagonally across the wearer’s body and over one shoulder with baby slung on one side of the body. In this article we focused on our top picks for baby wraps. We considered parents’ reviews and recommendations as well as the security, versatility, and usability of the products. While the choice to use a wrap comes down to your personal preferences, we found that a baby wrap is an ideal way to snuggle your newborn or young baby. As with any baby-related product, it’s important to understand the risk factors involved with baby wraps. Baby wraps are secure as long as they are used correctly. Your baby should always be in an upright position with their chin off their chest and their face visible above the fabric. It takes time to learn how to use a baby wrap, so we strongly recommend reviewing written materials, watching instructional videos, and working with a friend or babywearing educator when possible to ensure that your baby is in the safest position. Weight range 8 to 35 lbs. 7 to 35 lbs. 8 to 35 lbs. 8 to 36 lbs. 8 to 35 lbs. 7 to 35 lbs. 8 to 35 lbs. 8 to 36 lbs. When you think of a baby wrap, you probably picture the popular MOBY Wrap: a long, stretchy piece of fabric that wraps around you and secures your baby on your chest. Because the fabric is so long, it fits all body sizes, which is especially great if parents take turns using the wrap. It also means you can tie the wrap snugly for the best fit. Because the fabric goes all the way around your body, the baby’s weight is evenly distributed, so it’s comfortable to wear for long stretches of time, and babies often fall asleep with such close, constant contact. There are a few drawbacks to this product. Because there is so much fabric to work with, users can overheat, especially in the summer months. There is a lightweight version with more breathable fabric, the MOBY Wrap Evolution (on Amazon), which you may want to consider if you live in a warmer climate. The long fabric requires a bit of practice to wrap and wear correctly—this is not a product you can wear straight out of the box—so be patient and expect it to take some time. Keep in mind that the fabric of the MOBY Wrap will stretch out with continued wear, so it will eventually become more difficult to get the super-snug hold you want. Although learning how to properly wear a wrap may seem daunting, most users agree that once you get the hang of it, you and your baby will love the MOBY Wrap. The MOBY can be used with babies from eight to 35 pounds, but most users agree it’s best for infants and children younger than one year. Babies can be wrapped in four different positions, either facing toward you or on the hip. While it is technically possible to carry a baby on your back or facing out, it is not recommended or endorsed by MOBY. Weight limit: 8 to 35 lbs. 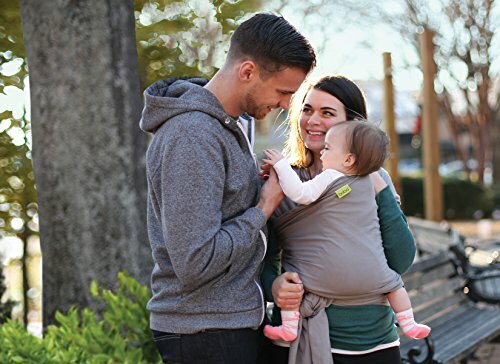 The Boba Wrap Classic Baby Carrier is similar to the MOBY Wrap in price, design, and wear, but with one key difference: the Boba fabric contains 5% spandex, making it noticeably stretchier than the MOBY fabric. This is both a pro and a con: On the one hand, the extra stretch means you can pull the wrap tight and snug. On the other hand, it stretches out more quickly, so it’s not ideal for babies older than one year. However, the close contact is perfect for infants and comfortable for parents. The Boba Wrap is also about 18 inches shorter than the MOBY Wrap, which might be perfect for petite users, but not ideal if you or your partner is larger. With so much fabric wrapped around you (not to mention the body heat of your child), the Boba can get uncomfortably warm to wear for longer periods. And like the MOBY Wrap, the Boba Wrap takes some time to learn how to use properly, but the company provides resources for learning how to properly tie the wrap, along with lots of information about safe babywearing practices. Boba recommends only two positions with the wrap, both with the baby on your chest facing you in an upright position. Weight range: 7 to 35 lbs. Like the MOBY and Boba, the Baby K’Tan is a wrap-style carrier made from soft, stretchy material. But unlike other wraps, the K’Tan has two loops stitched together that cross over your shoulders and around baby, plus a support sash to secure the hold. It is easy to slip on and much more user friendly than long, complicated wraps. Another plus is that the Baby K’Tan doesn’t lose its shape or stretch out as easily as the wraps do. The Baby K’Tan has six carrying positions on the front and hip, but none to carry baby on your back. The biggest drawback to the Baby K’Tan is that it comes in clothing sizes instead of a one-size-fits-all design. That means you won’t be able to share with your partner or anyone else unless you are very close to the same size, so it’s less versatile than the other wraps on this list. It is also better for babies younger than one year, but some users reported that once babies became too wiggly, it wasn’t supportive enough to be comfortable or safe. As with other wraps, parents tend to get overwarm with the K’Tan, though there are other options: the K’Tan Breeze (on Amazon) is cotton mesh for better breathability in hotter climates, and the K’Tan Active (on Amazon) is polyester to wick away sweat and block UV rays. Weight range: 8 to 35 lbs. Although not technically a wrap carrier, the Infantino Sash earned a spot on our list for its ease of use and wrap-style versatility. A mei tai sash is a cross between a soft-sided carrier and a wrap—you get a soft-sided carrier seat for baby, but instead of shoulder straps that buckle or clasp, you slip four straps in place to create the perfect fit for any body size or type, so it can be shared between multiple adults. The Infantino Sash has padded shoulder straps for the wearer’s comfort and a padded head support panel for baby. It also comes with a detachable sun hood, like other soft-sided carriers. Because you aren’t working with yards of tight-fitting fabric, the Sash is not overly warm, which users definitely appreciate, and it folds up much more compactly than a regular soft-sided carrier. One feature users appreciate is that there are instructions for proper wearing inside the Sash itself, so you can always check to make sure you are getting it right. 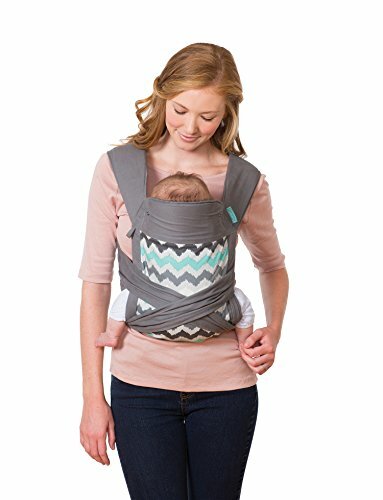 While not as intuitive as a regular soft-sided carrier, it is much easier to get the hang of than a traditional wrap carrier. The Sash has just three recommended carrying positions, one of which is on the back, which you can’t do with a regular wrap carrier. However, please note that you’ll need assistance to get your child in and out of a back carry. The weight range is for babies from eight to 36 pounds, but this is the one carrier on our list that isn’t as ideal for newborns. There’s not quite as much support as you want, so it is difficult to use the Sash with infants who need their heads supported all the time, as you’ll have to use one hand to support the baby and the other to manage the ties. However, once babies can hold up their heads, the Infantino Sash is an excellent choice. Weight range: 8 to 36 lbs. The number-one rule for babywearing, regardless of the type of wrap or carrier you use, is to make sure your baby’s airway remains open at all times. BWI recommends keeping the baby high enough up on your body and always in an upright position so you can monitor breathing and make sure the chin is off the chest with the mouth and nose unobstructed. A good rule of thumb is to keep your baby’s head close enough to kiss. Make sure that whatever carrier you use provides adequate support for your baby’s head, keeping the baby’s hips and legs in the ideal position. According to the International Hip Dysplasia Institute (IHDI), the best position for a baby is for their legs and hips to fall to the sides naturally with the thighs supported and the knees bent. This is called the frog position, M-position, or spread-squat position. When babies are carried on the front facing the parent, their legs will naturally be in this position, so it isn’t a huge concern with wraps. It is something to keep in mind, however, especially with other carrier types. Wraps and soft-sided carriers are equally safe as long as they are used correctly and age-appropriately. Wraps like the ones reviewed in this article are better for infants and babies but less safe for older babies who are particularly wiggly or heavy, and you shouldn’t use them once your child is over the age of one. Soft-sided carriers are perfect for older babies and toddlers, but they often need to be adapted to securely support newborns and infants who can’t hold up their heads on their own. Although different carrier types have different strengths, the level of safety is the same when used appropriately. Note: While baby slings are similar to wraps in many ways, Consumer Product Safety Commission (CPSC) warns against using slings for babies under four months. Slings are not inherently dangerous, but they come with additional safety concerns, which is why we recommend wraps or soft-sided carriers over slings. If you do a sling, read all the instructions and warnings and be careful to use them correctly. Babywearing with a baby wrap is an excellent way to snuggle your newborns and young babies, and though most of them aren’t ideal for older children, most parents find that they get a lot of use out of the wraps before their children get too big. Of course, your choice of carrier will come down to your own personal preferences in terms of comfort and usability as well as how often you use your carrier and where (for example, at home versus hiking). Whether you choose a traditional wrap, a mei tai, or something unique like the Baby K’Tan, be sure you understand how to use the product safely and review the proper position for baby to be in. Then relax and enjoy having your child so close everywhere you go! Do you use baby wraps with your child? Tell us your favorites below!